Below see some of the frequently asked questions about the Camcaddy Universial Camera Battery Charger. 1. If I have connected the battery incorrectly i.e. got the + and – the wrong way round (reverse polarity), will CamCaddy damage my battery? • No this will not damage the battery, but CamCaddy will not deliver a charge in this position. 2. My battery has slots for the Battery Terminals will CamCaddy be able to charge it? • No, sorry, CamCaddy cannot charge battery’s of this type yet unless the Power Tips are able to connect to the battery’s terminals. 3. 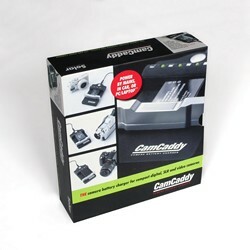 Can CamCaddy be powered when there is no mains or car power available? 4. Will CamCaddy be able to charge my laptop battery? • No. CamCaddy will not be able to charge a laptop battery. 5. LED 4 is on and it is Red – what does this mean? • This means one of two things: either a power supply is connected to CamCaddy without a battery inserted; or that the camera battery, if inserted, is fully charged. 6. How long will it take to charge my camera battery? • This will depend on the size of the battery but somewhere between 40 minutes and 2 hours. • Yes but because a PC USB only delivers 5.5v you will only be able to charge lower voltage batteries up to 5.5v. In most cases this will mean SLR and Camcorder batteries will not be charged if connected via this method.